The new chapel measured 28′ square and 15′ high to the wall plate. The Primitive Methodist magazine for August 1852 contains an account by Hugh Campbell of the opening of the chapel on 23rd May 1852 with sermons from J North of Grimsby and W. Briggs of Hogthorpe. A successful tea meeting was held the following day. The last service was held in the chapel at Christmas 2003 and it was then converted into a private house. The PM Chapel was within the Louth PM Circuit 1835-1932/3. Ref. Meth/B/Louth P/H/1/5: year 1854. Ref. Meth/B/Louth P/H/1/6: year 1864. Ref. Meth/B/Louth P/H/1/7: year 1873. Ref. Meth/B/Louth P/H/1/8: year 1886. Ref. Meth/B/Louth P/H/1/9: year 1895. Ref. Meth/B/Louth P/H/1/10: years 1900-1908. Ref. Meth/B/Louth P/H/1/11: years 1911, 1915, 1918. Ref. Meth/B/Louth P/H/1/12: year 1929. Ref. Meth/B/Louth P/H/1/13: year 1930. Ref. Meth/C/Theddlethorpe, St.Helen’s/H/4/1? : Sunday School Account Book, 1890-1932. Ref. Meth/C/Theddlethorpe, St. Helen’s/C/2/1: Trust Account Book, 1851-1897. Ref. Meth/C/Theddlethorpe, St. Helen’s/C/2/2: Trust Account Book, 1897-1932. Ref. Meth/B/Louth P/ (microfilm ref. 2/77): Circuit Baptisms, 1831-1837. Ref. Meth/B/Louth P/A/? : Circuit Baptisms, 1873-1932/3. Ref. Meth/B/Louth P/A/1/2: Circuit Baptisms, 1836-1875, with a Stewert’s/Steward’s Accounts, list of subscribers Preachers Book-Room, year 1838. The first word is now St.Helen, this having been altered in the past from the word Primitive, previously the wording much neater. Close-up viewing would also conclude this. Ref. 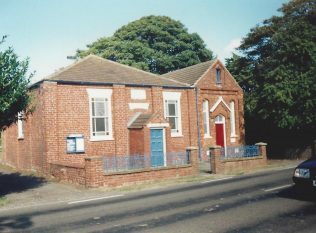 ML199251: Sunday School, Primitive Methodist, Theddlethorpe St. Helen’s, Fen Lane?, built 1888, adjacent to the PM Chapel, built 1852. Ref. Meth/C/Theddlethorpe/, Saint Helen’s, Saltfleet Rd., 1852, first Chapel 1835. Ref. Meth/Theddlethorpe/Saint Helen’s/C/2/3, (Primitive): Chapel Keeper’s Expences Book. Ref. Meth/C/Theddlethorpe, Saint Helen’s/J/4/1: Notes on the history of the Chapel (Primitive Methodist). Ref. Meth/C/Theddlethorpe, St. John’s/A/1/1 (Wesleyan Chapel) to include some ex-Primitive baptisms 1904-1924. Ref. D10C/DISS/4/1835/8: Certificate for Nonconformist Chapel: Theddlethorpe, year 1835. (It is not clear if for St.Helen’s PM Chapel or St. John’s-Wesleyan Chapel, or a Baptist Chapel).